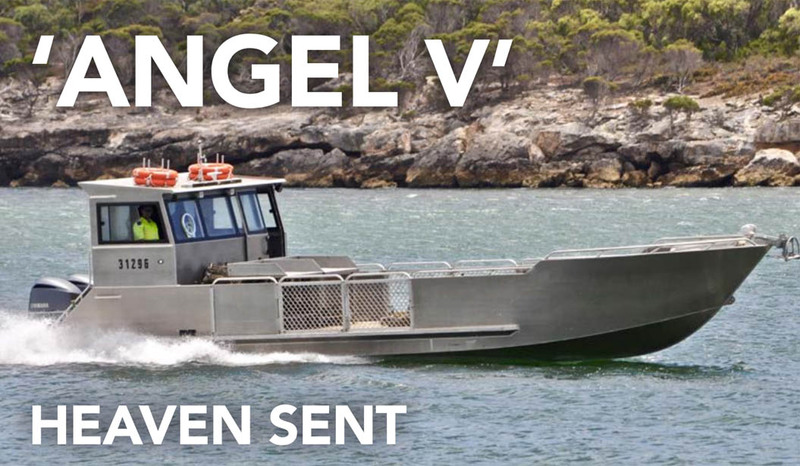 Angel Oysters has taken delivery of their latest aquaculture utility vessel Angel V, a 12.6 metre fast aluminium monohull that has entered service with their Coffin Bay operation as business expands. Built by West Coast Welding at their Streaky Bay facility, Angel V features a beam of 3.9 metres and a draught of just 50cms. 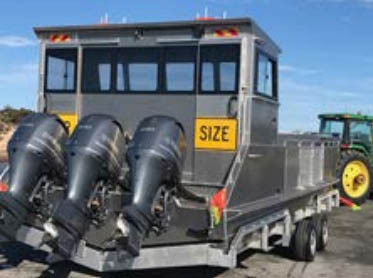 She was designed by the team at Oceantech, also of South Australia, and will be used primarily for the transportation of oysters and oyster-growing infrastructure. West Coast Welding was selected for the job based on an existing relationship with Angel Oysters for whom they’ve previously completed fabrication work. Angel V is rated to carry a cargo of 10 tonnes and is capable of reaching speeds of 38 knots. 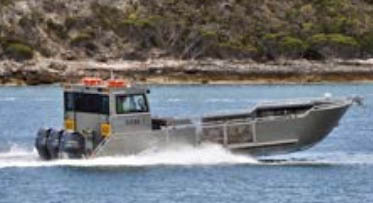 Thanks to her three Yamaha F300XCA outboard motors, each producing 224kW @ 5,000rpm, Angel V lifts out of the water and dashes across the waves even with a full load of oysters aboard. The journey from the shore base to the farming areas is around 20 nm so being able to minimise the number of journeys was of utmost importance and is why the large deck area is so valuable. Featuring 29m2 of clear space, the deck is able to accommodate a significant volume of fresh oysters for transfer to the oyster shed. 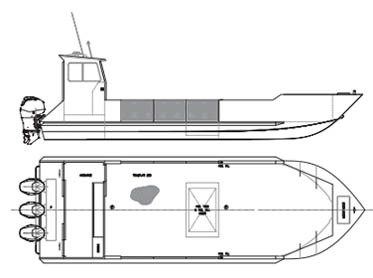 A simple wheelhouse at the rear of the vessel provides shelter for the crew during transits and features direct access forward to the working deck as well as aft to the outboard motor mounts. The wheelhouse is fitted with plenty of windows from Alfab which offer excellent viewing of the work deck as well to the sides and aft. 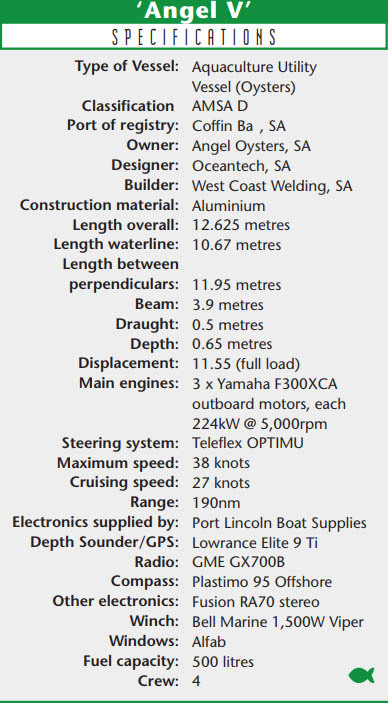 Electronics were sourced from Port Lincoln Boat Supplies and include a Lowrance Elite 9 Ti combined depth sounder and GPS, a GME GX700B radio and a Fusion RA70 stereo for providing some background tunes for the crew whilst they work.